Image Editing Software done right! A complete image editing software suite, FotoWorks XL 2019 has been updated and revised, making it a powerful tool for all user of the Windows operating system. If you want to edit an image professionally on your PC, then you will have to look for some specialist image editing software. Nothing that comes within the Windows operating system is really up to the job of providing professional level image editing tools. Thankfully, great value image editing software Windows 7 users and above can use is available in the form of FotoWorks XL 2019. What's more, this program will provide the same image editing software Windows 8 users can take advantage of as it does for those running earlier versions of the operating system. The comprehensive software suite allows you to do all of the usual things you might want with your snaps, such as cropping them or changing their sizes. In addition, this image editing program will allow you to carry out a number of advanced techniques that help you to create much more memorable photographs, such as operating color correction and removing red eye. Whether you are looking for image editing software for Windows 10 or earlier, FotoWorks XL 2019 can help. It has been upgraded and the latest version of the image editing program offers plenty of new options to make finessing your pictures a breeze. 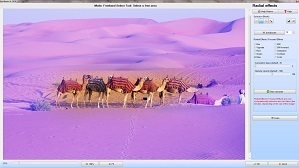 With a simple user interface, FotoWorks XL 2019 is image editing software Windows 10 users can pick up quickly even if they have little experience with digital editing techniques. Like all good image editing programs, it offers advanced options which can be controlled on a pixel by pixel basis, when required. If, on the other hand, all you want is to edit a image you have made with the program's preset controls, then that is easily possible, too. Finally, cost effective image editing software for Windows is available which provides professional features at a price that the average user can afford. It is the first choice image editing software for PC users, whether they are professional photographers, graphic designers, website developers or amateur users who want to improve the quality of their pictures. Easy to use but incredibly powerful, FotoWorks XL 2019 has a huge number of features that allow you to use this image editing software in a way that suits your creative needs. To edit an image to a professional level requires a degree of skill but you also need the right image editing software (or photo editing software), too. Thankfully, FotoWorks XL 2019 provides all of the image editing tools that you will ever need in a single image editing software suite. 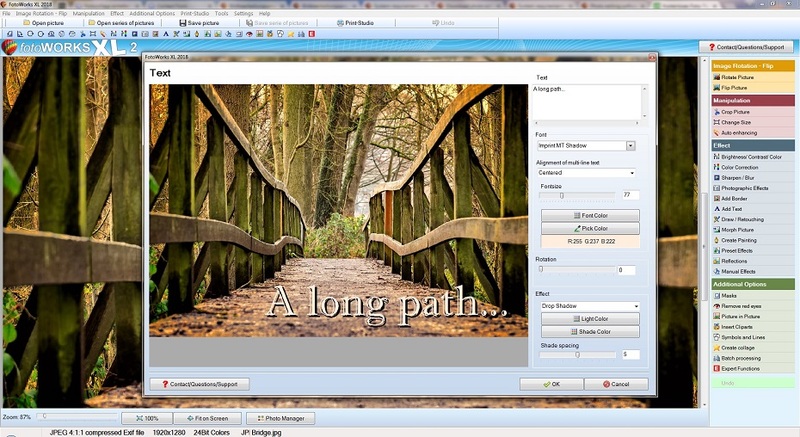 You can edit image, text, clip art and any symbol you have inserted into your picture with ease. To get going, many users of this image editing software will use the automated functions to see how much better their pictures can be by only taking a few steps. For example, FotoWorks XL 2019 offers you the chance to use auto enhancing to make your pictures appear more vibrant than before. Just navigate to the 'Manipulation' section of the image software package which is located on the right-hand side of the screen and click on 'Auto Enhancing' which has a magic wand icon to make it easy to spot. The image editing software then pops up with a new dialogue window which shows you a thumbnail of your current picture on the left with the automatically enhanced version on its side. If you like what you see, then simply hit the 'OK' button for the enhancement to automatically take effect. Not sure that it is an improvement? No problem because all you have to do is hit 'Cancel' and the picture will revert to its former look with no editing having taken place. Another example of the advanced ways you can edit an image is with the morphing option. Click on the 'Effect' menu at the top of the screen of the easy photo editing software and a range of options will appear including 'Morph Picture'. Select this and try it out on your photograph. It is great for skewing parts of an image and making original and often funny alterations to your photos. Much-used with portraits or selfies to generate odd effects, morphing can also be utilized to create warps and zooms in localized areas of your picture. Want to create bug eyes or a long nose? This is the image tool for you. Of course, there are a large number of other effects and processes that are used in this image editing software (or picture editing software), too. These include things like drawing and retouching, altering the brightness and color saturation or blurring areas of your composition, to name but three. All in all, FotoWorks XL 2019 provides you with just about every tool you could wish for when it comes to editing pictures. Looking for a simple way to print your pictures from an image editing software system that does not need extensive technical know-how? If so, then FotoWorks XL 2019 is for you. Not all image editing programs offer the chance to print your pictures in exactly the manner you would like to. This is not the case with FotoWorks XL 2019 which is an image editing software suite that provides advanced printing options. All users will find the printing section of the program easy to use and the perfect way of converting their edited digital imagery into a physical format. Simply click on the 'Print-Studio' button at the top of the main screen to see the advanced printing options that are available to users as standard. Firstly, you can set up your printer for various options, such as whether you wish to use Imperial or metric measurements. In print mode, you can position your image just as you please, for example by centering it or having it situated at the top left or bottom right of the page, as you prefer. FotoWorks XL 2019 will also allow you to fit the image to the size of the page, use a specified size or to fill the entire page, depending on your particular needs. 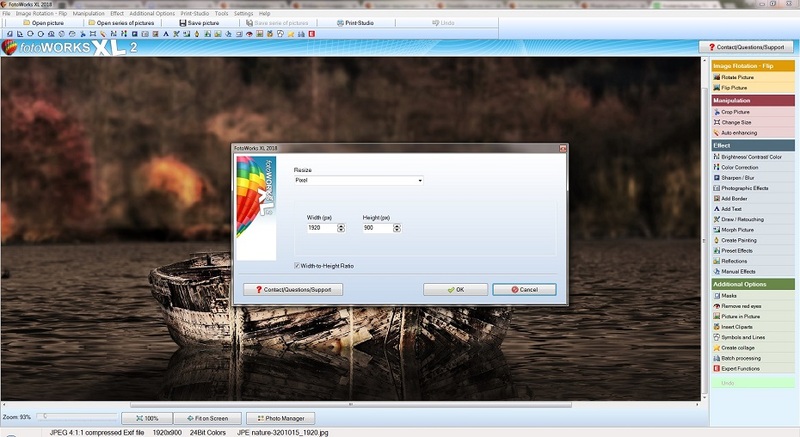 The image editing software also allows you to adjust the default margins that your printer might be using. There's even a gamma correction option for advanced users who want to ensure the printed version of their picture looks just as good as the digital one does on screen. It is all easy to operate and the results only need to be seen to understand just how helpful FotoWorks XL 2019 can be in creating superb printed albums. Another key advantage of this image editing software is that it allows you to create photographic albums from scratch. Just select the 'Print Photo Album' option from 'Print-Studio' and you are away. 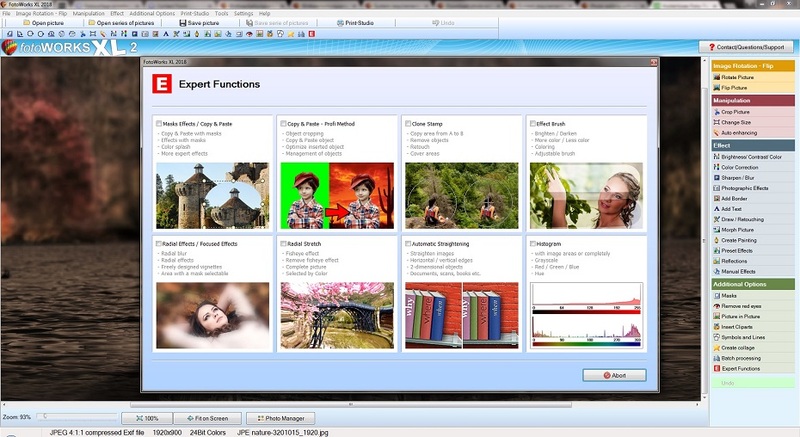 A dialogue window opens up that allows you to select the images you want in the album from thumbnails you see on screen. Of course, given that this is a comprehensive image editing software package, you can still make changes, such as reordering the content, adding text, altering the font of the text and even include shadows and borders. Any pr ofessional image editing software must allow users to copy and paste images in convincing ways and FotoWorks XL 2019 is no exception. Not all simple image editing software on the market offers the advanced functions that FotoWorks XL 2019 does. A good example of the sort of advanced picture manipulation you can achieve with the image editing program is the Pro method of shifting elements within photos around. 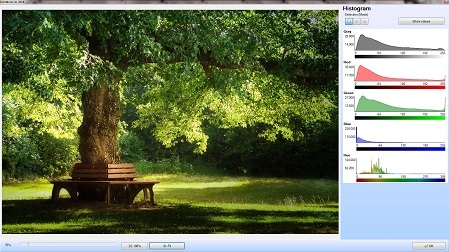 Sometimes called green screening, the Pro method can be accessed from the image editing software by clicking on the 'Expert Functions' button at the bottom of the right-hand side of the main screen. Once selected, the expert functions menu appears in a new window which includes options like masking effects and radial stretching. Select 'Copy & Paste – Pro Method'. The program then provides you with a step-by-step guide of how to cut out the section of the image you want to use elsewhere. Firstly, select the approximate area you will work in using a rectangular selection tool by dragging it around. Now hit 'Cut Object'. The next step is to use a primary color, like green, which is distinct from anything that is already in the picture. Then choose a brush size to draw around your chosen image. You can make it easier to guide yourself around the outline of whatever you are selecting by using the slider tool that the image editing software provides. This zooms you in an out to assist with fine-tuning your work. Once the image has been drawn around, fill in the rest of the unwanted part of the image using the same color. To speed things up, a good tip is to use a larger brush size. Hit 'Next' when you are ready and the image editing software will allow you to insert your chosen image into another picture. Choose this from a file on your PC by clicking on the 'Load your own background' button. As you might expect, the program offers a great deal of choice in editing even at this late stage. Using the Pro method, you can alter the saturation, hue and size of the object you are now inserting. 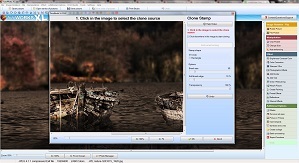 Users who are new to this sort of advanced image manipulation can find help by viewing one of the tutorial videos the software developers have produced which gives an example of what to do at every stage of the process. Bear in mind that similar video tutorials have been made for a number of the expert functions that are on offer in FotoWorks XL 2019. Even if you have never used these sort of advanced editing techniques before, you will soon become accustomed to the principles behind them and start producing better images than you ever did before within minutes. 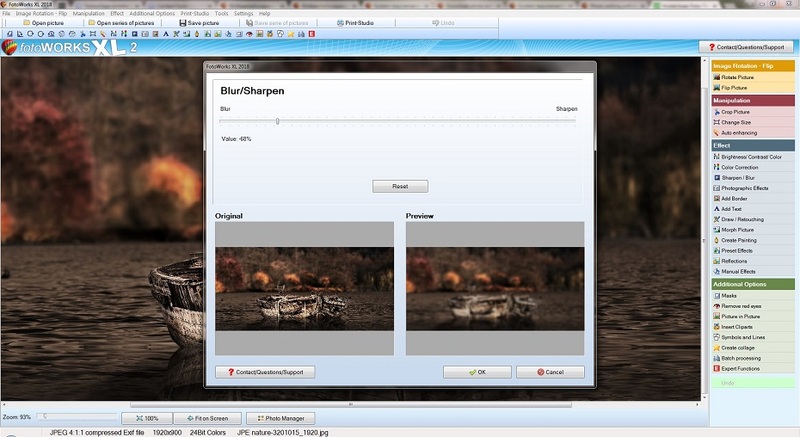 Even with advanced options, this is an easy image editing software suite to operate. If you want to know how the advanced options of this image editing software can improve your final pictures, then bear in mind that it won't cost you a cent to try it out. This free download image editing software comes with all of its features, options and advanced functions to trial without cost. If you are not sure whether the image editing software suite is as simple to use as it has been described or whether the expert functions it contains will be as effective as you might like, then simply try it out without obligation. 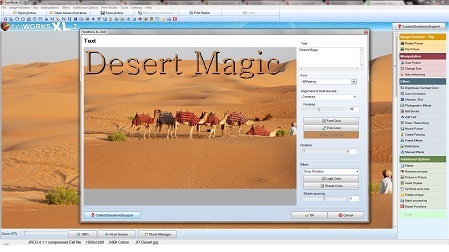 Just choose the image editing software free download button and get using all of its controls immediately. Want to make your photographs look better and become more appealing to editors or clients? Choose the image editing software download from FotoWorks XL 2019. Not only will you have all of the features at your fingertips that provide you with the ability to alter photographs in impressive ways, but you will be able to learn more about advanced editing and to develop your image manipulation skills, as well.